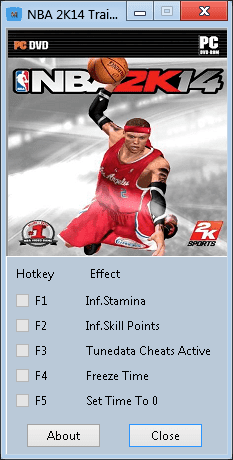 Description: Here's a simple yet very useful +5 trainer for NBA 2K14 PC, which allows you to instantly make use of the infinite stamina, unlimited skill points, time-freeze and other cool cheats that will help you get high grades in MyCAREER mode. F1 No fatigue effect. Your player will not be tired even if you sprint all day. F2 Get an infinite amount of SP for your MyPlayer with just a single press of a button. F3 Higher chance of pass, steal, and shooting percentage for your controlled player, whereas the CPU gets lower %. In addition, reach-in fouls are less likely to be called. F4 Freezes the current time, excluding the shot-clock. F5 Ends the current quarter immediately. * Works in Quick Game / Play Now, Association, Blacktop and other modes as well. Infinite Stamina - There are times that it will take longer to activate. Also, it will stop working for about 20 seconds after you score a basket, but it will eventually work again. Unlimited Skill Points - Press the hotkey to activate, then buy something to see the new value which is 999,999,999 SP. You need to have enough skill points to buy something. Tunedata Cheats - When enabled, it will set the shooting percentage to 1 and foul, steal, and pass to -1. When Disabled, it will set back to the default value, which is 0.5. Right click the trainer .exe file > Choose 'Properties' > Check the 'Run this program in compatibility mode for:' box > Select Windows 7 or Windows XP SP2. FAQ: I already deactivated the trainer and reinstalled the original tunedata file but the F3 cheat remains. What should I do? Go to MyCareer > Game Settings > Change the game style back to "Standard".